If the only measurement in social media is buzz, then Cathryn Sloane got it right. 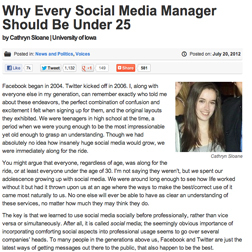 Her post, entitled Why Every Social Media Manager Should Be Under 25, has been shared several thousand times over. The word count across the 490 comments outweighs her 550-word opinion two hundred fold. Unfortunately, almost all of the reaction has been negative. Enough so that The Next Gen Journal, which published it, defended her while claiming she didn't represent its views. Conner Toohill went so far as to ferret out one person who said it was starting to look like adults cyber-bullying a kid. You can't crush other people's cookies and expect to eat yours unbroken. While Toohill claimed many young people share Sloane's opinion, she didn't do the people she was supposedly speaking for any favors. Her article, not her age, was demonstrative of why some young adults aren't ready to lead in thought or action. And to be fair, many of the comments left by "older people" demonstrated they aren't ready either, despite some sporting titles that suggest they do. I'm embarrassed for some of the commenters, especially those I know. Any reactionary comments that attempted to put her in her place because "in time, she'll know better" are as ridiculous as her article. All it did was reinforce what those who identify with her expect: People who are supposed to be mentors aren't ready to listen. Someone needs to tell Sloane that age has nothing to do with it. Maturity isn't defined by age and age doesn't dictate performance. Sloane wrote an immature piece, but not because of her age. It's immature because it emboldens the discrimination that she professes to fight, just in the opposite direction. It's immature because it conveys that she has confused her identity with that of her generation, something no social media manager can afford to do. And it's immature because it exemplifies what happens when someone picks up such an argument in such a way that even those who might somewhat agree cannot possibly defend it. Where I might have defended the concept, for example, is that ageism is one of the last antiquated and discriminatory characterizations that people are still quick to embrace without consequence. But I cannot defend her because she never conveys empathy but expects it. Ageism is wrong in both directions. I've been fortunate both in the field and in the classroom to know better. I've been influenced and inspired by people who are both younger and older than me at work. And I have found that the most talented writers to pass through my classes are neither hindered nor elevated by age or experience. They are only hindered by themselves and the labels they choose to embrace. Sloane is so hindered here. Me? I ignore all labels. The best performances win. It's like the Olympics. Go for gold or go home. The real crumbling point of the Sloane argument has nothing to do with age. If we can get past the age thing for a moment, Sloane alluded to the idea that people who have been immersed in social media at a younger age are somehow superior to those who embraced social media at an older age, despite having relatively the same amount of time on the platforms. It's not true. It's not true for several reasons. It's not true because participating on a social network is different than working on or managing social networks. It's not true because the qualifications have less to do with the malleable platforms and more to do with understanding the social and psychological behavior of online groups. And it's not true because, as her article demonstrates, the people who populate networks are multigenerational with a propensity to take exception to those who are exclusive instead of inclusive. Otherwise, there is one overlooked gem of an argument tucked inside her article. She more or less says that it doesn't feel fair when employers dismiss candidates based on education and experience alone. I understand the feeling because I didn't understand it when I graduated into the 1991 recession. The no-holds-barred truth of it? They don't owe you anything. You have to earn it. There are four ways to earn it. You can develop a professional network while you are still attending college, planning ahead for the day you aren't earning grades but paychecks. You can get lucky and stumble into one of the very few employers who have an affinity for students and feel compelled to give them a break without abusing them. You can buck up and accept a position that is the lower rung on the ladder, whether it's an internship or entry level position, and make yourself indispensible. Or you can put up your own money by starting a company to prove your professional prowess. I mostly belong to the latter group, which is the smallest. I'm not too proud to say that it wasn't by choice as much as necessity. It took me two years, but I leveled the playing field, erasing the perceived advantage any "older" professionals had over me. And 20 years later? You still have to earn it. Other reactions and rebuttals (without any implied endorsement).